This photos above show a stone nut and the great spur wheel of the Prairie Mill. The left photo shows the stone nut in the "disengaged" position and the right photo shows the stone nut engaged with the great spur wheel and ready to turn the attached millstone. 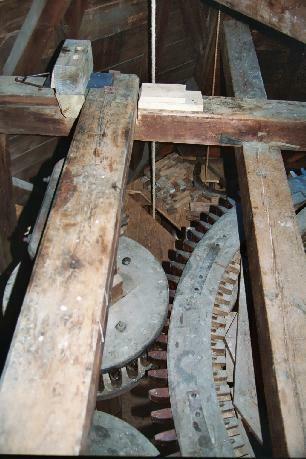 The great spur wheel is the largest geared wheel in the windmill and is at the bottom of the main spindle. It drives one of three millstones through the stone nut and stone spindle. The stone nut is at the top of the stone spindle which is attached to a "runner stone." The runner stone is top millstone that turns above the bottom millstone, or "bedstone." The Prairie Mills Windmill could operate only one millstone at a time.